After an image of Reese's Pieces Peanut Butter Cups leaked online three months before it was to launch officially, the brand had to figure out how to drive and sustain excitement over a product consumers could not immediately purchase. After an image of a new Reese's product leaked prematurely online, the Hershey Company turned the incident into a timely and successful campaign. A photo on Facebook of Reese’s Pieces Peanut Butter Cups – a Reese’s cup filled with crunchy mini Reese’s Pieces – was leaked in April, three months before the product was set to launch. The image picked up 40,000 shares and led to a social media frenzy and widespread speculation online about the possible new product. Reese’s social channels were also inundated with questions from consumers. The confectionary company took ownership of the product conversation and drove traffic to branded channels by purposefully confusing consumers. The brand could have remained mute until the product was launched several months later or just confirmed the product in order to stop consumer confusion. Instead, Reese’s saw this as a unique opportunity to play up its humorous brand personality while connecting and engaging with fans. The brand's internal comms team and external PR partners, including Ketchum, Havas, and UM, had to act quickly in order to take part in the conversation about the product following the leak. Because the product wasn’t going to be available for three months, Reese’s senior brand manager Ryan Riess explained that a challenge was figuring out ways to drive excitement over a product consumers couldn’t immediately purchase. "At first, we actually wanted to drive confusion," he said. "When we saw the leaked image and post, we immediately noticed two things: fans were beside themselves with excitement, and they were confused [as to whether or not it was real]. Everyone loves a mystery – why not have a little bit of fun?" The campaign team leveraged culturally relevant events happening around the time of the leak -- specifically Cinco de Mayo and Mother's Day -- to act as a springboard for a conversation about the new product. The branded hashtag #Cupfusion was created in order to support the campaign efforts on social media. Reese’s assembled a core team complete with internal experts and external agency partners and launched the #Cupfusion campaign. The brand started to post a series of cryptic images and GIFs on its Facebook and Twitter channels that neither confirmed nor denied the new product. 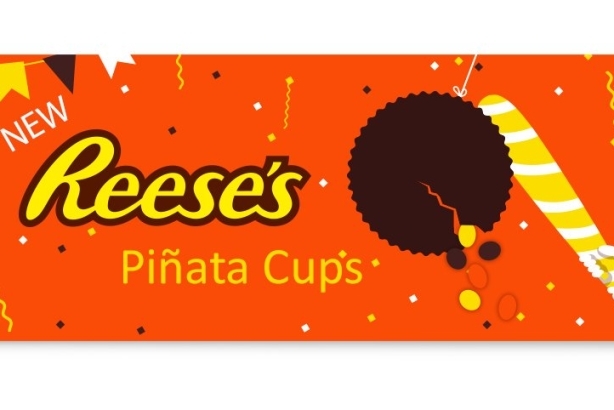 On Cinco de Mayo, the brand created a fake teaser about Reese's Piñata Cups. A few days later, the campaign team posted a GIF about Mother's Day, using the #Cupfusion hashtag. The playful content and back-and-forth dialogue between the Reese’s brand and its fans kept the conversation going before the brand was finally ready for the real reveal. The #Cupfusion strategy was originally intended to last about two weeks before the brand would confirm the product. However, the integrated team kept a keen eye on the conversation and was ready to pivot quickly if the right opportunity for official confirmation of the product presented itself. As rumors about the new product began to creep into the news cycle over the next few days, the Reese’s team knew it was time to make a move. The new product was unveiled via a Facebook "press conference," inviting consumers and top-tier media alike to tune in to the news. The brand bolstered the May 12 announcement with a press release. "The leak was real and it allowed us to think about our go-to-market strategy differently," said Riess. "We decided to act and drive excitement before the product was available, which is not a common practice. The excitement has generated a buzz and excitement that I have never seen with our retail partners." Just like the leaked photo, news of the confirmation went viral. The announcement post on Facebook received nearly 750,000 views in less than 24 hours, topping out around 1.3 million views. The campaign generated more than one billion social and traditional media impressions through news stories online and national and local broadcast segments. Notable outlets that covered the news include: Fox News, CBS, Mashable, Business Insider, and Fortune. The buzz also led to significant business results. Retailers nationwide inundated the Hershey Company’s sales team with calls, asking how soon they could receive the new product. Since the launch of #Cupfusion, volume expectations have increased more than 100% for the new product. The brand continues its #Cupfusion campaign on its social media channels with GIFs, images, and videos.